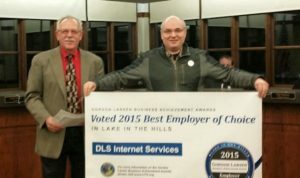 (January 15, 2016) Lake in the Hills, ILL – DLS internet Services (DLS) has been awarded the 2015/16 Gordon Larsen Business Achievement Award for “Employer of Choice”. This award recognizes a local business that promotes a positive example and rewarding environment within the business community. DLS was recognized as the “Employer of Choice” by a judging committee who considered both the quantity and quality of the nominations and input from employees from local area businesses. Lake in the Hills President and Trustees congratulated DLS and Sam Rozenfeld at an awards ceremony, recognizing DLS’ extensive list of employee benefits and some of the many employee comments that contributed to the committee’s decision. DLS Internet is a successful provider of Information Technology and Voice over IP solutions for small and medium size enterprises. DLS has strong expertise in IT networking, network security, data center operations, VoIP telephony and fixed wireless broadband (RF). DLS owns and operates two datacenter facilities in the Chicago Metro area providing monitoring and 24×7 US-based support to ensure continued and reliable services. ← How Can Voicemail Hurt You?